Liftoff is currently anticipated to occur at 9:23 UTC Nov. 16, 2018, from Pad 0A at the Mid-Atlantic Regional Spaceport. According to NASA, among the cargo being transported to the ISS inside the spacecraft are several experiments, including a study to explore how different levels of gravity can affect concrete hardening, an experiment designed to further study the effect of long duration microgravity on vision perception and a device designed to demonstrate an ability to recycle waste plastics into filament for 3D printers. 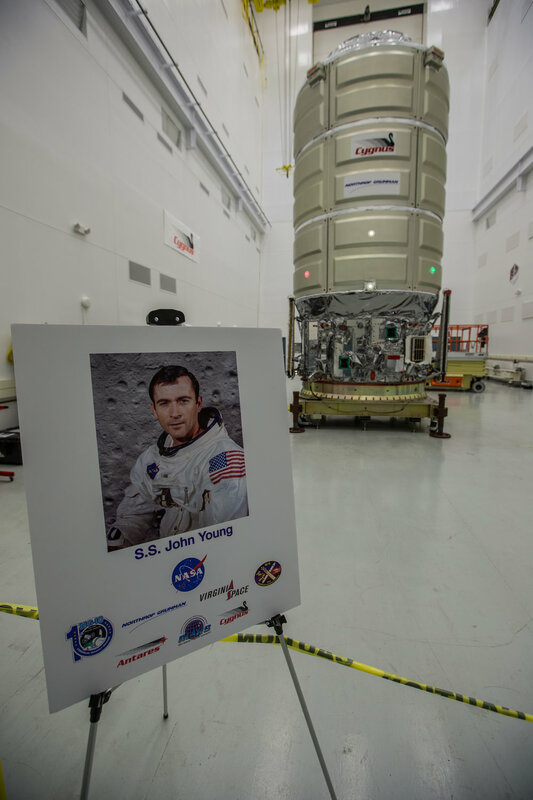 On Oct. 25, 2018, Northrup Grumman unveiled the name for the NG-10 Cygnus: S.S. John Young after the astronaut legend that flew to the Moon and commanded two space shuttle missions. Between 1965 and 1983, Young flew into space six times. His first flight was aboard the Gemini 3 spacecraft — the first crewed flight of the Gemini program. He also flew into space in 1966 as command pilot of Gemini 10. During the Apollo Program, Young was the command module pilot for Apollo 10 and the commander for Apollo 16 in 1969 and 1972 respectively. During the latter, Young and his crew mate Charles Duke spent 20 hours, 14 minutes walking and driving on the lunar surface. Just under a decade later, Young would once again be in the spotlight as the commander of the first space shuttle mission, STS-1 in 1981 and again as commander of STS-9 in 1983. Both were aboard Columbia. This flight is expected to be the 10th Cygnus flight to the ISS under the Commercial Resupply Services contract with NASA. One more Cygnus flight is expected to completed the original CRS contract. Then the CRS2 contract missions will begin. The NG-10 mission will also be the ninth flight overall for an Antares rocket and the fourth by an Antares 230 variant. Moreover, this mission will mark the seventh flight of the longer Enhanced Cygnus. When this Cygnus arrives at the ISS, it will position itself about 10 meters below the Destiny module. There, the Expedition 57 crew will use the 17.6-meter robotic Canadarm2 to grab the spacecraft. It will then be maneuvered to the Earth-facing port of the Unity module. As of November 2018, it is expected that the NG-10 mission will remain berthed to the ISS until February 2019.